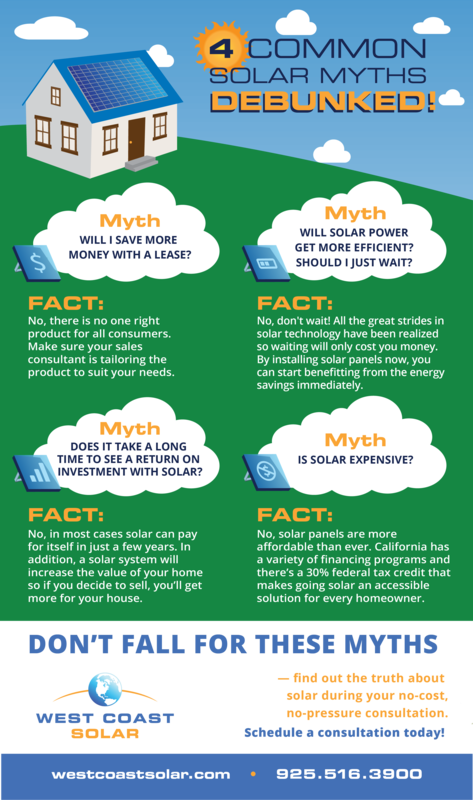 Infographic: 4 Common Solar Myths Debunked | West Coast Solar, Inc.
4 Common Solar Myths — Debunked! Myth #1: Will I save more money with a lease? Fact: No, there is no right product for all consumers. Make sure your sales consultant is tailoring the product to suit your needs. Myth #2: Will solar power get more efficient? Should I just wait? Fact: No, don’t wait! All the great strides in solar technology have been realized so waiting will only cost you money. By installing solar panels now, you can start benefitting from the energy savings immediately. Myth #3: Does it take a long time to see a return on investment with solar? Fact: No, in most cases solar energy can pay for itself in just a few years. In addition, a solar system will increase the value of your home so if you decide to sell, you’ll get more for your house. Myth #4: Is solar expensive? Fact: No, solar panels are more affordable than ever. California has a variety of financing programs and there’s a 30% federal tax credit that makes going solar an accessible solution for every homeowner. Don’t fall for these myths — find out the truth about solar during your no-cost, no-pressure consultation. Schedule one today!